Truck Hit a Church and Injures Three (November 27, 2017) On Monday a truck hit a church and injures three people in East Earl, Pennsylvania after first colliding with another vehicle. In a news article from The Republic, apparently a feed mill truck and a sport utility vehicle collided in an intersection on Route 625. The sport utility vehicle was making a turn through the intersection near Bethany Grace Fellowship Church on Monday morning. 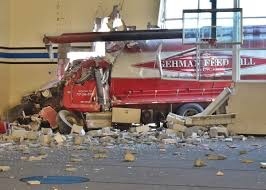 In a statement from local police, the feed mill truck, after colliding with the sport utility vehicle traveled into the church penetrating into the building and coming to rest in the church’s gymnasium. Route 625 was shut down in the area of the accident so police could tend to the injured and evaluate the accident. No names or ages of the injured have been released and police have not indicated if any responsibility for the accident has been assigned. The Chief of the East Earl Police Department, Kevin McCarthy, indicated that all the injuries seemed not to be life threatening.